I’m lucky enough to have my very own knight-in-shining armor — something not every high-tech marketer can say, I feel certain. 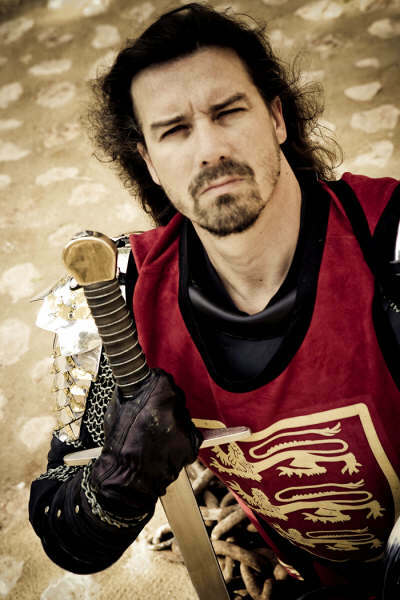 My champion is my son, Geoffrey McAlister, and he really is a knight-errant for hire (for movies, live shows, commercials, and photo shoots in just about any corner of the globe). 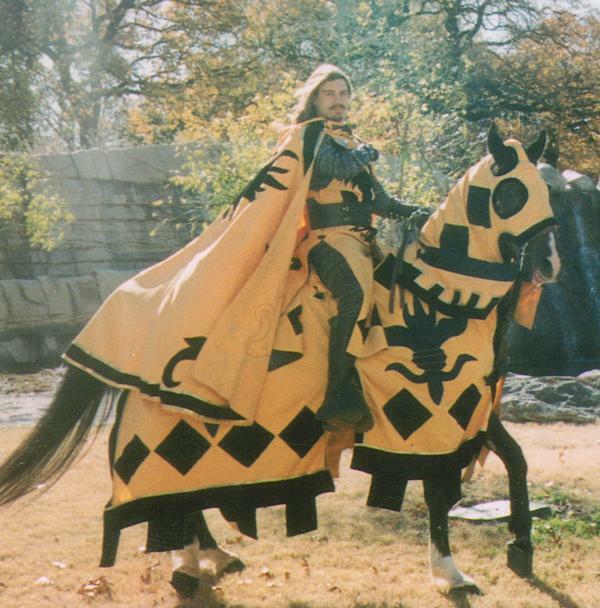 What can a modern-day manager learn from a medieval knight? Quite a bit as it turns out. I think most parents learn a lot from their children, and I’m no exception. Here are four practical lessons that have made me a better marketer, a much better manager, and a better person besides. Arm yourself with the right weapons. For my son, that means learning to use the tools of his trade (a variety of swords, javelins, spears, a mace, flame throwers, shields, and who knows what else), and knowing when each one makes sense in a performance. It also means knowing how to use them effectively, and safely. Yes, in Geoff’s performances they rehearse the battles but that’s real fire, the “breakaway” lances don’t always break, and a galloping horse can do an awful lot of damage. The wrong weapon for a marketer results in a different kind of pain. Having attempted to deliver results without the right tools in the past, I’m now very picky about the weapons I take into the battle for market share. Recruit a band of loyal knight companions. A knight knows he’s unlikely to achieve his quest without his loyal companions — and those of us who are in a quest for business success can’t do it alone, either. My son networks with stunt coordinators, stunt performers, stable hands, trainers, weapons and prop masters, costumers, dancers, actors, casting agents, and nearly everyone else he meets when he’s performing from the vendors selling souvenirs to the ticket takers. He’s an amazing networker — I’ve seen him field calls from superstars and down-on-their luck friends, and he treats them exactly the same: with friendliness, respect, and courtesy. (Frankly, I wish I was as good at it as Geoff is.) For me, it means having a wide-ranging contact list of vendors, freelancers, agencies, sales reps, journalists, analysts, researchers, bloggers, peers and mentors I can call on for help, referrals, advice, and new ideas. Suit up and show up, ready to do battle, no excuses. 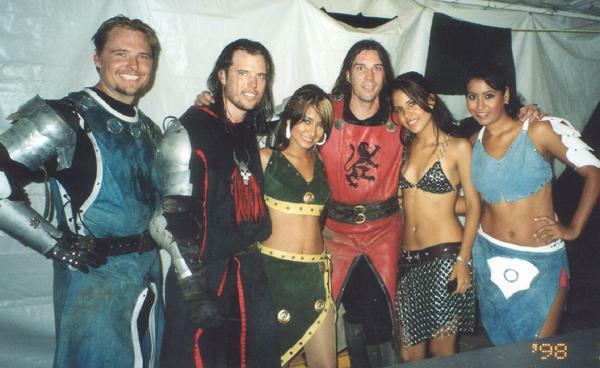 For several years, Geoff was a lead performer at the Excalibur in Las Vegas. He worked five days a week, 8-10 sold out shows a week. Like they say, “The show must go on.” I’ve seen him limp home bruised and sore — but you’d never know it from the energy and showmanship he displays in a show. After the show, no matter how tired he is, or what he’d rather be doing, he’s always the last performer to leave the “meet and greet” sessions with patrons who want to meet the performers afterwards. I’ve seen him perform with injuries — and I’ve seen him smile for photos when I knew his heart was breaking. Whether he’s meeting a superstar, a child, or a medieval history buff who wants to talk about the details of hand-to-hand combat, he takes the time to listen, engage, and respond. It’s not that different in the business world. The work has to get done — and deadlines don’t wait because I’m tired or cranky. Suiting up and showing up means more than just being there, though. It means being there, fully engaged with the task at hand — and that’s the hard part. Be gracious when you lose, and even more gracious when you win. 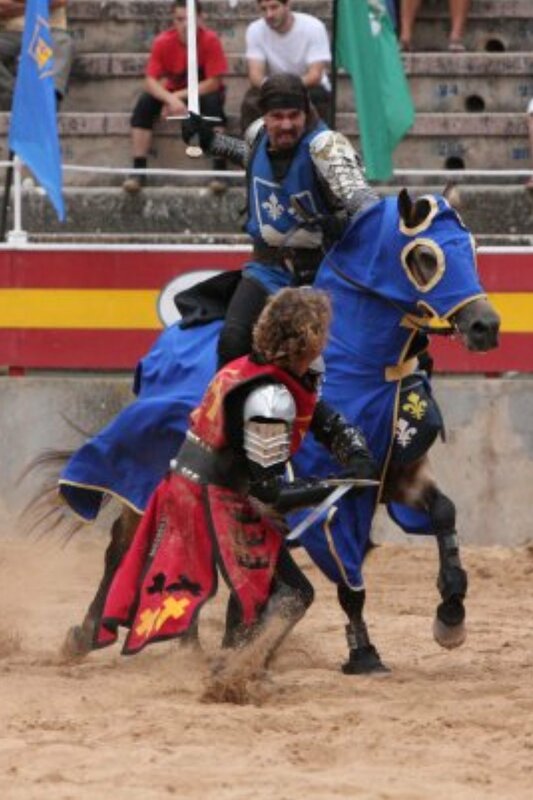 When he started working in this business, Geoff worked at Medieval Times in Dallas. Most of the performers got along well, and understood that sometimes you win, and sometimes you lose. But there was one guy — there’s always one, isn’t there? — who never seemed to get that. He was hyper competitive, and took it personally if he wasn’t crowned the champion at the end of every show. In rehearsals, he was always critical, and he never seemed to appreciate the fact that he was part of an ensemble cast. No one was sorry to see him go. I think that happens in any business, and any career. I’ve hired people who fired me, helped someone who resented it when I was promoted over him find a great new job, mentored people and been mentored by others. I’ve never regretted being nice to someone, but every time I’ve messed up a relationship with a co-worker (usually by simply not paying attention), it’s come back to haunt me, sometimes in surprising ways. How about you? 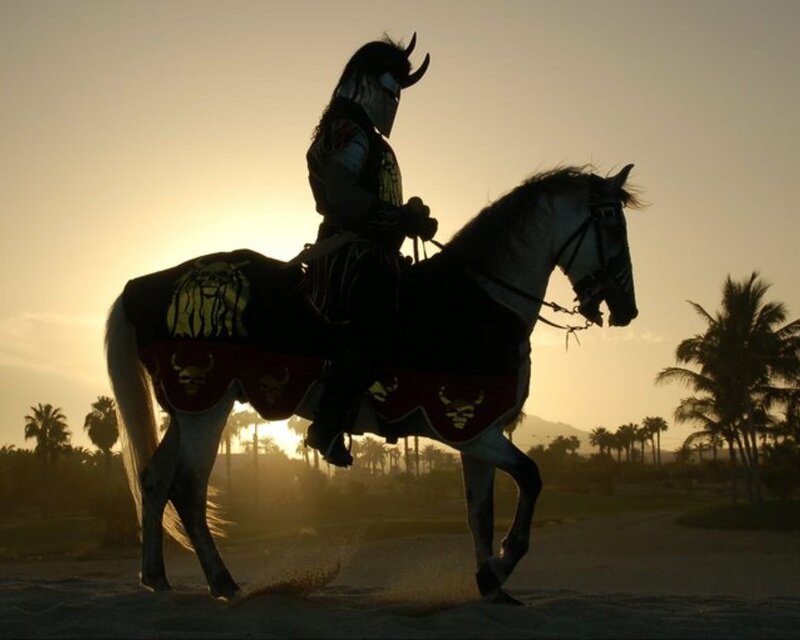 What’s your code of chivalry, and how does it help you in your everyday business life? Just because I can, I’m going to end this post with a few more photos of my son and the performers he works with. I hope you enjoy them! 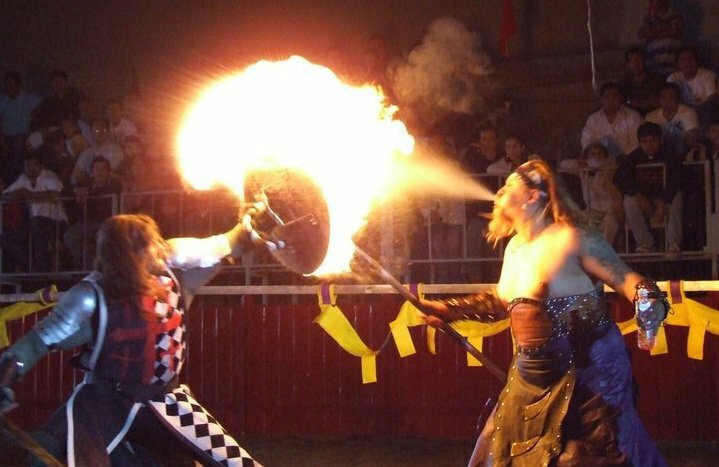 And if you need a knight-in-shining armor or even a complete medieval show for an event, I’d be happy to put you in touch with the best in the business. Sierra in shadow -- isn't this a gorgeous animal? 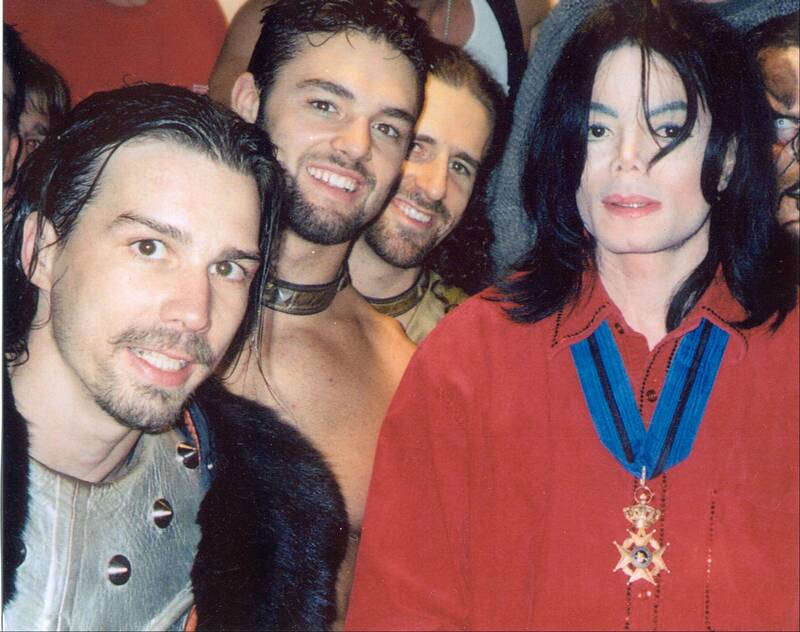 Yes, that's really the king of pop, when he brought his kids to meet the knights at the Excalibur. This is a shot of Geoff from a video he shot a few years ago. I wouldn't ride full gallop in terrain like that! Gallery | This entry was posted in Uncategorized and tagged Deb McAlister, distributed marketing, Geoff McAlister, marketing. Bookmark the permalink. 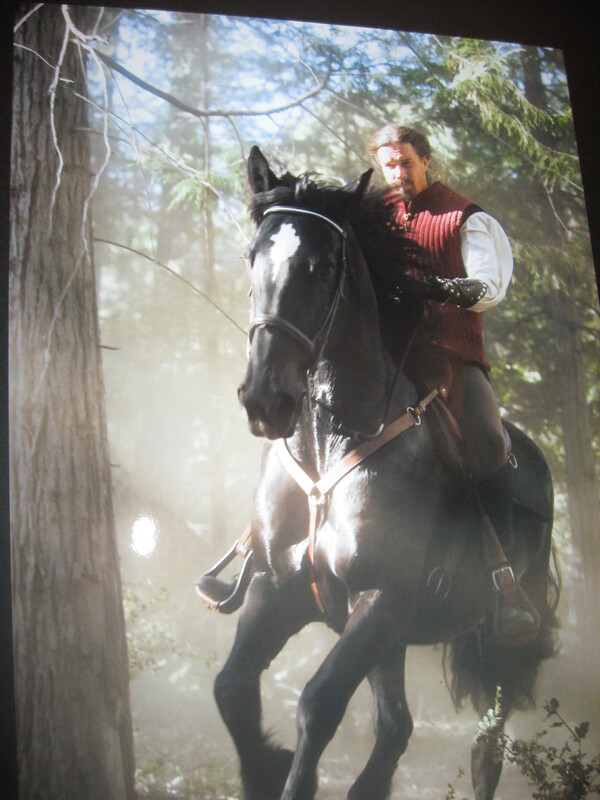 Geoff is a great knight and even greater friend…. I agree — and a great son, too. I am very proud of all my sons! Read this article and the comments as well…..Moved me to tears. Beautiful. Thanks for the kind words! I am proud of my son, and all of my kids and grandkids have taught me valuable lessons. I am blessed to have my very own knight in shining armor! Well I don’t think I had ever read this mom. I know you sent it a few years ago and by no means was it out of no interest in reading it. I just had no idea what a blog was and what to do with it. I am very blessed in my line of work and even more blessed to have been raised by such a trooper and strong woman. I am a reflection of you and what you stand for. Thanks for the kind words and check it out.. Krystal is now 22 and a mommy and she made it because we cared enough to be there. You were there for me so I had to be there for my daughter.. Thanks again mom!! I love you! This was published in several places — this blog, the Distributed Marketing Blog, and a couple of other sites that picked it up. I have very seldom written anything that got more positive comments — and I know I’ve only written one or two things I believed more. I don’t know where I’d be, or what life would have been like without you and your brother. So very many times, your hugs and your laughter and your amazing conversations salvaged days that would otherwise have been filled only with work and loneliness. I could not have asked for more wonderful sons. You have both taught me more than you know about what it takes to be a good human being. I still tear up remembering the night you came to Children’s, still sweaty from your show at Medieval Times, to cradle your daughter in your arms through a painful procedure while you told me that your lifelong heroes from the Dallas Cowboys had come to your show that night — and invided you to go with them to an after party. But you passed, telling them that you had somewhere more important to go. You were just 20 years old — a time when so many young people are still selfish adolescents, but you put your promise to a little girl (and to me, to relieve me so we could trade places again the next day) above fun. If that was an isolated instance, it would still be remarkable. But it is not. You’ve always worked hard for the people you love — and you love so many people. The fairytales and storybooks talk about the codes of chilvary, and how knights in shining armor are supposed to live up to high standards. You certainly do that, and it isn’t possible for a mom to be prouder of a son than I am of you. You and your brother are so different — but so much alike. Fiercely protective of me and your children, strong in ways that I can only marvel at, and my heroes. Every day. I don’t know how I got so lucky, but I thank my stars every day that you are my sons. And again Deb, I must say, these are traits in both of you sons, and grandchildren. Must of been you they got it from. This is the reason I love you guys, all of the McAlisters, heart and soul. Thanks, Gayla! I think the fact that they’ve been friends with a lot of good people for allt hese years helps, too — but you are right: I am proud of Jason & Geoff, and all the kids. Good people! We love you, too. So when are you coming to see me? First off Geoff is gorgeous but more importantly he sounds like a wonderful person. Deb this is so well written I liked reading it and learned from it. It is real food for thought. I am so impressed with you and all you do. Thanks, Salen! I am proud of Jason, Geoff and Jordan — they are all wonderful men who are easy to be proud of. 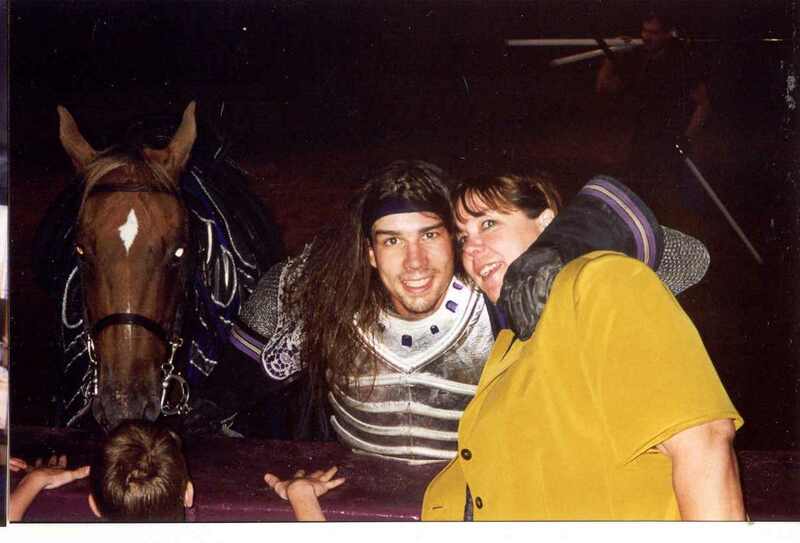 One of the times I was proudest of Geoff was back in 1993, not long after he started working at Medieval Times in Dallas. Krystal was in the hospital, and he arrived about 30 minutes after the show ended. He was holding her and soothing her after a procedure and telling me that the Dallas Cowboys had come to the show, including one player who was a favorite of my football-obsessed son. (Remember, he was barely 20 years old then, and dealing with a child with a heart condition, plus doing these shows.) And he very calmly said, “Yeah, Deion Sanders and some of the other players invited the knights to go and party with the Cowboys, but I told them I had to be here.” For me, that was that bar mitzvah moment: today my son is a man. I know this because he opted to come to a hospital and cuddle a little girl instead of “hanging” with a bunch of celebrities. I think that’s when I started jotting down notes for myself on things I was learning from him!